Sometime before Thanksgiving we (Hykel and I) agreed to bring bread to Thanksgiving Dinner. Rolls, specifically. I figured when we’d agreed to it that we would probably just be buying something at the store and taking them like we usually did. That week however, I got it in my head that making them at home would be better. I’ve always enjoyed cooking and baking. It’s a creativity thing, and a making thing. Bread has remained as one of those things that was mostly out of reach. At some point during my formative years, I was taught that baking bread was an order of magnitude more difficult than other kinds of baking. I’d read cookbooks and talked to people on the subject. I’d walked away thinking that yeast was a fickle creature that was likely to ditch you at the first sign of too-hot of water or not-enough-rise-time, or that the total preparation time for bread was somewhere between 5 and a million hours, and that you need the knead the dough until the cows come home*. These things are mostly untrue, but they scared me off from trying to bake bread for a long time. I don’t know why I was captured by the idea of making the rolls for Thanksgiving. It was just sort of something that kept pinging at the back of my mind. The day before Thanksgiving I searched around for a recipe that would fit the bill. I found this one and it looked simple enough that I couldn’t get it wrong (easily). I had to double the recipe because we were going to a somewhat large dinner and I wanted to make sure that everyone got some. The rolls were baked that morning and done early enough that I got to make an Apple Pie as well. My mixer, which is an amazing machine. And here I have to make a confession to my relatives. We were given a fantastic KitchenAid mixer for our wedding by my Aunt Barb and Uncle Bruce. It is a mechanical marvel of engineering and the staple of any well-equipped kitchen. We had left it in the box for a very long time. 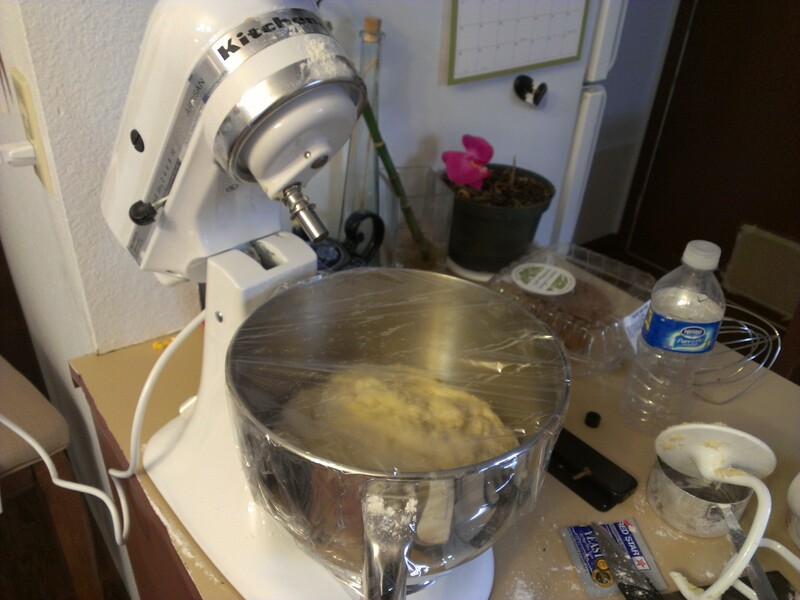 We’d also received a hand-mixer, and as previously mentioned I didn’t find many opportunities to use it. That morning I decided what the heck, I think I’ll pull that out and use it. This in fact may be the saving component of my baking skill. The mixer basically does all that hard kneading work for you and you get to simply throw stuff in there. Thank you Bruce and Barb for your wonderful gift. It’s awesome. 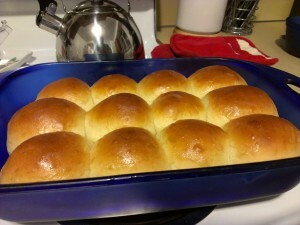 My rolls turned out tremendously well. Way better than I imagined they would. Golden-brown, and dense-but-delicious. I was very pleased with them. They were also a hit at dinner. On a whim I mixed up some honey butter to take with us and it was the frosting on the cake (or… butter on the bread I guess). Folks were surprised to find out that they were made from scratch. 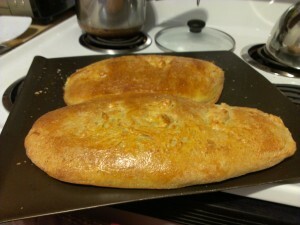 I was reminded of that feeling that bread from scratch was a fine and impossible art. My Thanksgiving day rolls. Right as they were going from rise to bake. Realizing that I was, in fact, capable of making bread, I decided that I should attempt more bread adventures (or “breadventures” as I now must call them). Attempt #2 was another thing that had long been of interest to me: French Bread. This time, I found a recipe on allrecipes.com. The recipe went almost without a hitch. I ran into a problem towards the end. Bread has to rise (as mentioned above). This is the process in which the yeast consumes sugar and turns it into CO2 that makes your bread puff up. 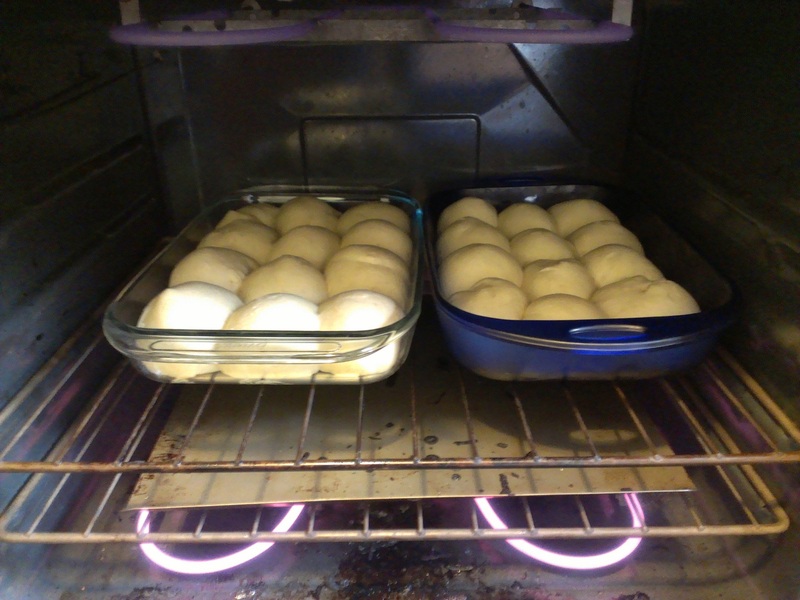 During the rising, you typically cover your bread with a damp cloth so the outer dough won’t dry out. You want it to be moist so it can expand during baking. I did cover my loaves, but I just laid the cloth on them. It was too heavy and prevented the loaves from rising up. Instead, they did a lot of rising out. I pulled the cloth off the dough and it pulled a lot of the dough with it. I did my best to scrape it off and put it back on the dough, but it didn’t go well. After baking I had two great, but very flat loaves. The internal texture (or crumb as I’ve heard it called) turned out great, needing (in my opinion) just a bit more salt. The crust also turned out fantastically. 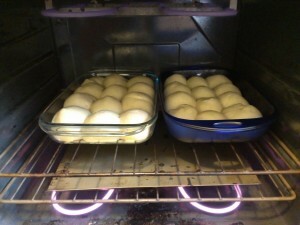 Making a good crust on french bread is done by brushing egg white on the loaf before rising and during baking. The more you brush on the crunchier of a crust you get. I put quite a lot on, and I’m not sure if it was too much or not. The Cheesecake factory doesn’t make this bread. They buy it from a bulk bakery somewhere in the midwest. There are a lot of “copy-cat” recipes for this. My criteria for recipes is often along the lines of “Are these common ingredients?” and “Can I make this with what I already have?” This bread answered both of those questions was a resounding no! There was a lot of variation in recipes, but the one that sounded the best to me was from this guy. Desiring to learn from his experience, I tried his second recipe out with tremendous results. I had to leave a few things out (Coffee because I don’t have it, caramel color because I couldn’t find it, and diastatic malt powder because I didn’t even know what it was) but the bread turned out wonderful anyway. In this case, I wished it was just a tad sweeter, but over all I was very pleased with the way it went. The molasses and cocoa seemed to be enough to get it dark. To me the color wasn’t a huge deal, but it was nice that it had the look to it. We ate these so quick that I forgot to get a picture. So now I’m a bread maker. My mom gave me a compliment at our weekly family dinner this past Sunday. She had mentioned to my grandmother how my rolls had turned out, and my grandmother had told her about how her mother (my great-grandmother) had a great talent in roll-making. My grandmother said that I had inherited the skill and I am very flattered by that. My second shot at rolls. This time with the suggested melted butter on top. *This is a metaphor. We own zero cows. I think I should come over and sample the fruits of your labor. Also, I am a genius with yeast, having made a lot of mistakes before. Ask me and I’ll tell you what not to do to get perfect bread. Odd that it cut off my name. I know I typed it in right. Weird. “Breadventures” – I’m going to steal that word. I’ve had several of those myself, but it’s been a while and I miss it. I think I should bake some more bread. I’m still looking for the perfect recipe though. I like bread to have a firm crust but soft and chewy crumb. I haven’t figured it out yet. When I let the dough rise I put it in a large, lightly greased bowl (a light spray of cooking spray) and cover it with greased plastic wrap, then cover that with a towel. The bowl needs to be large enough to let the dough rise, the sides of the bowl supporting the plastic wrap/towel so there’s no weight on the dough. The grease gives some lubrication to dough and makes for easier extraction. Pingback: Comfort food… « Phloggings will continue until morale improves…. If it is dense and chewy, it didn’t rise enough. I’ve never made bread using a bread maker my mom does thuogh but she uses boxed mix. I would suggest reading the directions on your bread maker all brands are different.